Barolo is referred to as the King of Wines and the Wine of Kings. Made with the Nebbiolo grape, Barolo is considered to be one of the finest types of wine in the world. The name also refers to the delightful little medieval hamlet in Piedmont’s beautiful Langhe wine region, in the Cannubi valley. The name itself interestingly has Celtic origins and the hamlet is host to many myths and legends. The beautiful small 10th-century castle was built in response to the many Saracen raids in the area. In the 13th century, the Falletti family who were bankers from nearby Alba (home to the truffle) took the castle over. Interestingly over time, the Falletti family “became” counts and then eventually Marquises in the 18th century. The lineage died out and in the ’70s the castle became public property. It now houses the regional wine cellar and a small museum. Barolo is a town that lives for wine. Almost all businesses are related to wine or food. There are wine shops, wineries, and restaurants with amazing wine lists. Needless to say, the hamlet is surrounded by vineyards. Almost all visitors also come for wine and indeed, Barolo is a perfectly delightful place to come on a wine tasting tour, magical. Nearly all the regional dishes from Barolo also feature the Barolo wines. 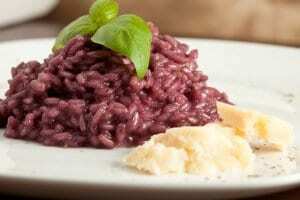 Specialties include “Risotto al Barolo” (utterly delicious! ), “Anguilla Piemontese con il Barolo” (a kind of Eel casserole with rice, cooked in Barolo wine) and Manzo al Barolo (Beef slow cooked in Barolo with cloves and herbs). You will find all the classic Piemontese dishes here as well such as Bagna Cauda, Fonduta and a host of rich meat and game dishes, which pair perfectly with the velvety red Barolo wines. Autumn is the time for gourmet tourists to visit Barolo and Piedmont in general, as you will see truffles on all the restaurants’ menus, and even white truffle if you are lucky. Located in the Piazza Falletti, the castle dominates the hamlet. It houses the Enoteca regionale and also the Museo Etnografico e Appartamenti Storici (Museum of Local Traditions and Customs) that has period furniture and a historic library on display. This is why most visitors come to the hamlet and there are a multitude of wineries in the vicinity, some open to the general public and some open by appointment. Marchesi di Barolo offers guided tours in English. Giacomo Borgogno, Fratelli Barale and Aldo Vajra are other top cellars in Barolo.